Suzanne Lacy speaks (Thursday April 28, 7-9 pm, at LACE – Los Angeles Contemporary Exhibitions – 6522 Hollywood Blvd, Los Angeles 90028) on her recent project in Bristol, England entitled The University of Local Knowledge, its process of engaging with over 300 Knowle West residents, and screens a selection of video “texts” in this first presentation in Los Angeles. Founded during the great depression in the early 1930’s, Knowle West is a small community in the southwestern English city of Bristol. Residents were relocated from run-down council estates (housing projects) to Knowle West to work in surrounding tobacco and bag factories. Eighty years later these factories have been redeveloped into urban lofts, but nearby Knowle West residents face unemployment, stereotyping, and limited access to higher education. Lacy worked with two art organizations in Bristol-the Arnolfini Gallery and the community-based Knowle West Media Center to produce an art project that brings together three spheres of knowledge: the arts, the university (University of Bristol), and Knowle West Residents. Knowle West Media Center staff and artists worked with Lacy to “map” Knowle West by recording 1,000 video pieces, called “texts” in this project, ranging from 30 seconds to 4 minutes each. Through extensive discourse with community residents, these texts were assembled into categories, or “courses” on a website to portray the “University” through the eyes of its residents. The site features “courses” on rabbit hunting (animal husbandry), raising children as a teen mom (adolescent psychology), growing organic vegetables (agriculture studies) and how to maintain classic cars (mechanical engineering). 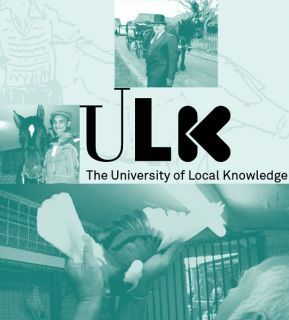 The University of Local Knowledge was funded in part by the Department of Cultural Affairs for the City of Los Angeles, The Arnolfini Gallery, and the Knowle West Media Centre.